In 1947, with Britain’s empire collapsing and Stalin’s rise in Europe, US officials under new Secretary of State George C. Marshall set out to reconstruct Western Europe as a bulwark against communist authoritarianism. Their massive, costly, and ambitious undertaking confronted Europeans and Americans alike with a vision at odds with their history and self-conceptions. Benn Steil highlights ten intriguing facts about the Marshall Plan (officially the European Recovery Program) and how it shaped the decades following World War II. 1. The Marshall Plan represented a radical departure from established American foreign policy doctrine. Since George Washington’s famous farewell address of 1796, US policymakers had sought not to “entangle [American] peace and prosperity in the toils of European ambition, rivalship, interest, humor or caprice.” The Marshall Plan was a conscious departure from this stricture, based on the understanding that huge changes in technology and commerce had made it impossible for the United States to isolate itself without serious consequences for its security and prosperity. 2. Marshall aid amounted to over $135 billion in today’s money, or $800 billion as a proportion of American gross domestic product. The total aid figure is higher still if we account for substantial non-Marshall military and other assistance in Europe. 3. The European Union and NATO were products of the Marshall Plan. All of the pillars of the postwar liberal order were created by the United States in a few short years after the end of World War II. The United Nations, the International Monetary Fund , the World Bank, and the predecessor to the World Trade Organization were launched between 1945 and 1947. The embryo of what would become the European Union was created in 1947, and NATO was formed to protect it in 1949: both were offshoots of the Marshall Plan. 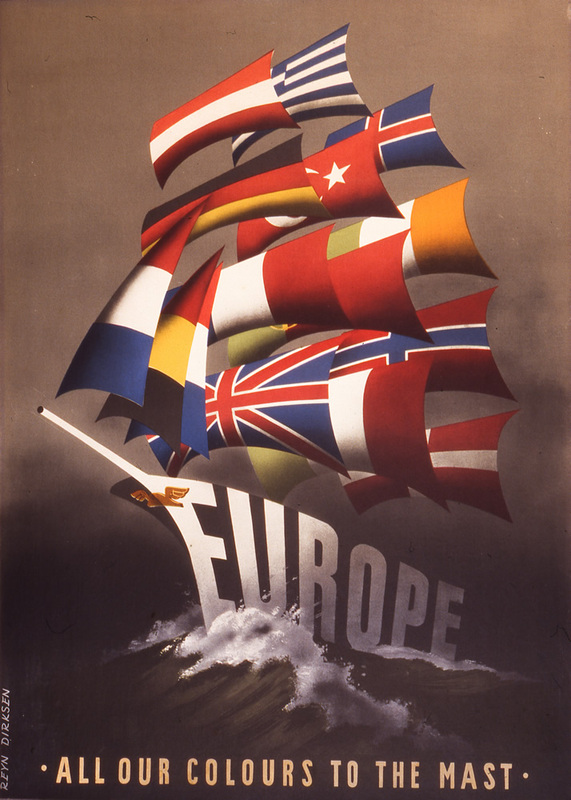 Poster created by the Economic Cooperation Administration to sell the Marshall Plan in Europe, 1950. Public domain via Wikimedia Commons. 4. 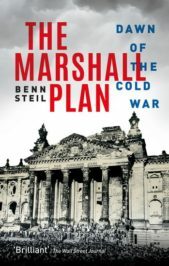 The Marshall Plan marks the true beginning of the Cold War. The Marshall Plan, created in the spring of 1947, marks the true beginning of the Cold War. Although tensions between the United States and the Soviet Union were escalating throughout 1946 and early 1947, it was not until General Marshall’s decision to launch a massive aid program—designed to keep western Europe in the democratic-capitalist fold—that relations between the two countries became irreparably ruptured. Stalin only abandoned negotiations with the United States over the establishment of an interim unified Korean government after Marshall’s initiative. 6. Germany was the heart of the Marshall Plan and the Cold War. At the heart of the Cold War conflict was Germany. Neither the United States nor the Soviet Union could countenance a united Germany allied with the other. When the United States decided to make a reindustrialized western Germany into the fulcrum of the Marshall Plan, Stalin tried to undermine it with the Berlin blockade. After the western airlift defeated the blockade in 1949, Germany was split and the boundaries of the Cold War in Europe were frozen for 40 years. 7. The CIA’s earliest major covert operations were in support of the Marshall Plan. One of the first priorities of the Marshall Plan was to keep the Italian Communists out of government, and the CIA played an important propaganda role in the critical April 1948 elections in support of the center-right Christian Democrats. A new US Office of Policy Coordination (OPC) belied its dull name by running covert operations in Europe to bolster Marshall Plan political aims, using Marshall Plan administrative funding. The OPC was merged with the CIA in 1951. 8. We are today replaying the collapse in U.S.-Russia relations that followed the Marshall Plan. The collapse of United States-Russia relations with the launch of the Marshall Plan and NATO is replaying itself today with the expansion of NATO and the European Union. Russia considers NATO and the EU hostile to its interests and is pushing back hard. The difference between then and now is that the United States and Western Europe were willing to accept a Russian buffer zone in Eastern Europe in 1949, but are unwilling to accept one today. 9. The United States has spent far more on reconstruction in Iraq and Afghanistan than it spent, in current dollars, on Marshall aid. The United States has spent about 50 percent more on postwar reconstruction in Iraq and Afghanistan than it spent, in current dollars, on the entirety of Marshall aid. Yet it has almost nothing to show for it. The main reason? A lack of security. Both countries remain under armed siege by foreign and domestic opponents, such as ISIS and the Taliban. A credible American security umbrella for the Marshall countries was vital to generating the confidence and capacity of Western Europe to rebuild after World War II. 10. The most striking legacy of the Marshall Plan is the endless desire to repeat it, but it has yet to be imitated. In the past ten years alone, western statesman and celebrity philanthropists have called for “Marshall Plans” in Ukraine, Greece, Southern Europe, North Africa, Gaza, and the Arab Middle East; “Marshall Plans” for global warming and global unemployment. Yet since the real one was created nothing remotely similar has ever emerged. Feature image credit: Rebuilding the Hotel Kempinski in Berlin with Marshall Plan aid, 1952. CC-BY-SA 3.0 via Wikimedia Commons. Benn Steil is Senior Fellow and Director of International Economics at the Council on Foreign Relations. His previous book, the prize-winning The Battle of Bretton Woods: John Maynard Keynes, Harry Dexter White, and the Making of a New World Order , was called "a triumph of economic and diplomatic history" by the Financial Times, "a superb history" by the Wall Street Journal, and "the gold standard on its subject" by the New York Times. His latest book is The Marshall Plan: Dawn of the Cold War.